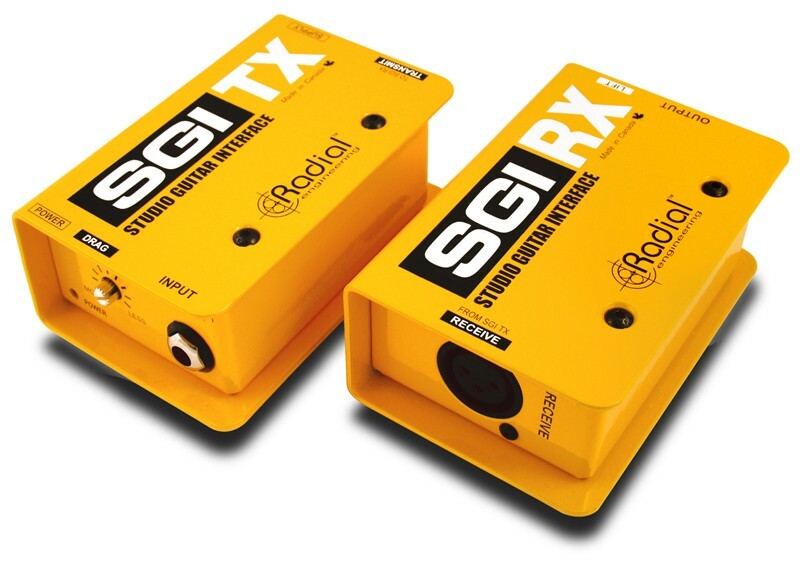 The Radial SGI studio guitar interface allows a guitar signal to travel 100 meters (328 feet) over a standard balanced XLR mic cable. This enables the guitarist to play through a distant amplifier while listening to the performance in the control room. On large stages, the SGI allows a guitar signal to travel from the wireless system to a pedal board and amplifier. The SGI employs a proprietary drive and balancing circuit that is made up of two modules: the SGI-TX transmit module and SGI-RX receive module. The SGI-TX is active with 100% discreet class-A circuitry and Drag™ control load correction to ensure the most natural sound. The SGI-RX is completely passive. To eliminate hum and buzz caused by ground loops, each module is equipped with isolation transformers that are wired in opposing directions to counteract any artifact. Best of all, the SGI is plug & play easy to use and comes equipped with power supply. Plug a standard 1/4" guitar cord into the SGI-TX input. Plug the TX 's low-Z XLR output into one end of a standard balanced mic cable up to 300 feet long and the other end into the SGI-RX receiver module's XLR input. The standard 1/4" output of the RX connects to your amp, mixer or effects. Dial up the perfect pickup loading for your guitar with the TX's Drag™ control and use the RX's ground lift switch if you need to eliminate any hum or buzz. ... Now you are all set to enjoy playing guitar in the control room while your amp setup remains on the sound stage, hundreds of feet away, with perfect guitar sound and zero signal loss or degradation.